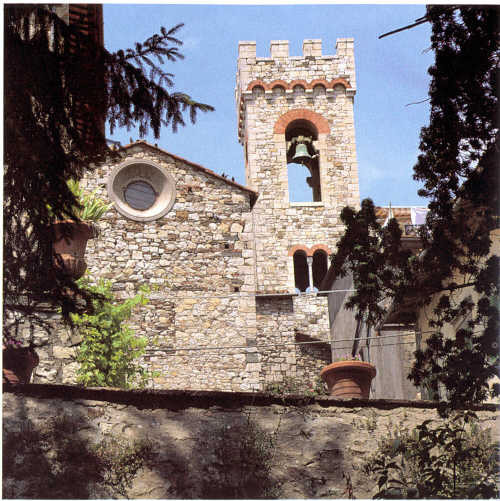 Located in the heart of the Chianti hills, Radda has maintained its charm intact from time immemorial. In the 50's its land and farmhouses were abandoned, but with its rediscovery in the 70's the old terraced olive groves and vineyards which by this time had fallen into disuse gave way to more intensive and extensive farming. Consequently the resumption of activity by the numerous large and small Agricultural Aziendas of the area, which fall within Chianti Classico boundaries along with top-quality wine and olive oil production famous even abroad, in recent years new artisans' and small industries - particularly in the construction, furniture, ceramic and terra cotta sectors - bave begun to make a Dame for themselves. Further development of the Agritourism sector and an increase in accomodation facilities has gone hand in hand with the increase in tourism. Radda, Monterinaldi, Volpaia, Castelvecchi, Albola. 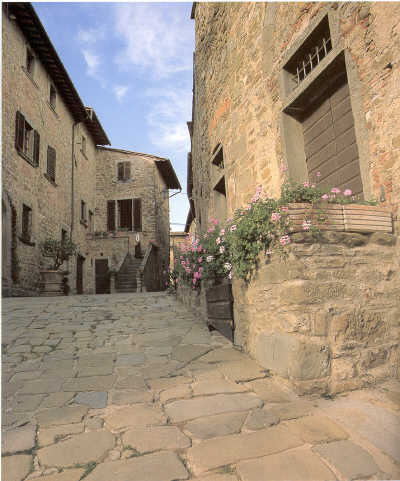 In IX-X AD and the beginning of the feudal area, fortification of Chianti began under Count Guidi and the Marchesi of Toscana; Radda became populated and started to grow. In 1100 Radda (whose Dame "Ratta" appears in an historic document of 1003) was the largest and most important in the area, also due to its central position and the vast area it could control. From the XI century on, a sharecropping system began to develop wherein the landowners gave small pieces of land to farmers who occupied rural houses often grouper around a church. Thus, local Priories were formed, which assumed considerable importance in the administration of all the smaller churches and whose duties included the care of the sick, the housing of the poor and the homeless, as well as administrative record keeping. From the birth of Municipalities through 1500 Radda was in the middle of warring between Siena and Florence for the establishment of their boundaries. Beginning in the middle of the XIII century, when the Republic of Florence organized its people into "Leagues", Chianti became one of the major ones, and Radda became the seat of the Podestà. 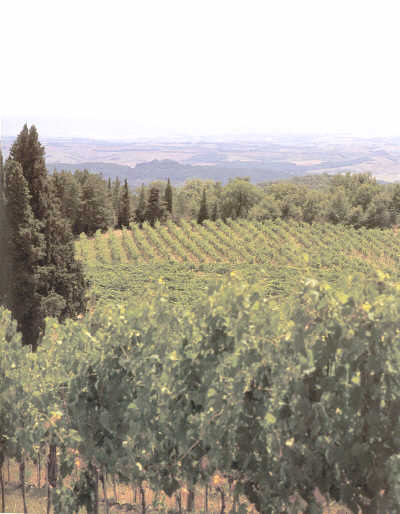 The sixth century has been described as that of the Chianti, in that it became known for its wine, which was already being exported to England in the mid '500. In the same are the farms and villas of the lords who came to Chianti to pass their summers in the country were built, among others the Strozzi and Pazzi families of Florence. Sharecropping became more widespread until the '.900s and was finally abolished only in 1967. 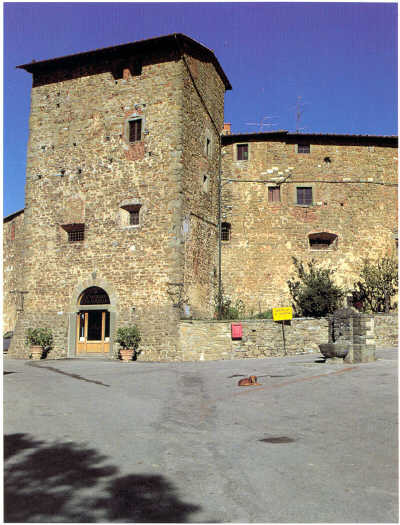 Today the fortified part of Radda encompasses within its walls the intact medieval village including the Podestà Palace built in '400 with its fifth century fresco belonging to the Florentine school. The coats of arms on the exterior walls of the palace date from '400 to '700, and one in particular is worthy of mention, directly below the loggia, representing Francesco Ferrucci "Hero of Gavinana" who held the position of Govemor in 1527, which was a politically turbulent era marking the descent of Carlo V In Italy across from the town hall is the Church of S. Niccolò with the wooden crucifix from the 1500's; and of notable interest are the Castle's Square, the Medieval Passageway, the Grand Duke's Ice house, and the fortified walk. 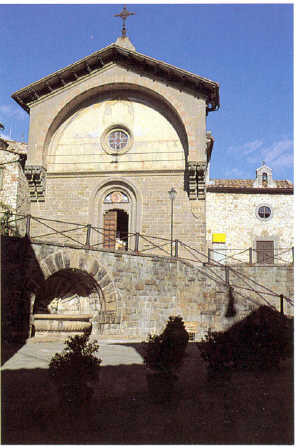 Nearby is the Franciscan Convent of S. Maria in Prato whose history goes back to the Medieval ages, was rebuilt '700, and houses the "Madonna con Bambino" of Neri Bicci dated 1474; the medieval village of Volpaia with its unusual religious structure, the church of S. Eufrosino of Volpaia called "La Commenda" (1443); the Castles of Albola and Monterinaldi; the village of Badia Montemuro called "La Badiaccia". A significant symbol of the religious organization is represented by the Pieve of Santa Maria Novella, which although remodeled inside in the last century, retains its originaI design asevidenced by the rich Roman capitals; of interest, the baptismal font with majolica tiles of the school of Della Robbia. The town of Radda is at an altitude of 530 m., extends over 80 square chilometers and has 1600 inhabitants. Its town city is Saint Brice in France in the Cognac territory. The affinity of their cultures, places, history and people was officializedby a ceremony in ApriI 1997 in Radda and in September 1997 in Saint Brice. From Barberino go to Tavarnelle Val di Pesa and Follow the signalization to S.Donato in Poggio. From San Donato in Poggio follow the signalization to Castellina in Chianti, then to Radda in Chianti. You can then continue your trip to Gaiole in Chianti.